New Orleans is a city filled with beautiful European architecture, Southern hospitality and charm, constant live music, and the most interesting and eclectic nightlife scene in the nation. If you’re looking for a place to spend a romantic day with your significant other, there’s no better place than the Crescent City. In order to represent our lovely city, we’ve put together a list of five ways to take advantage of what New Orleans has to offer for this upcoming Valentine’s Day! We’re a bit biased, of course, but we think our hotel is a great place to begin a romantic evening. The Carousel Bar’s beautiful interior design, scenic view of Royal Street, and world-class cocktail menu offer the perfect beginning to your date night. 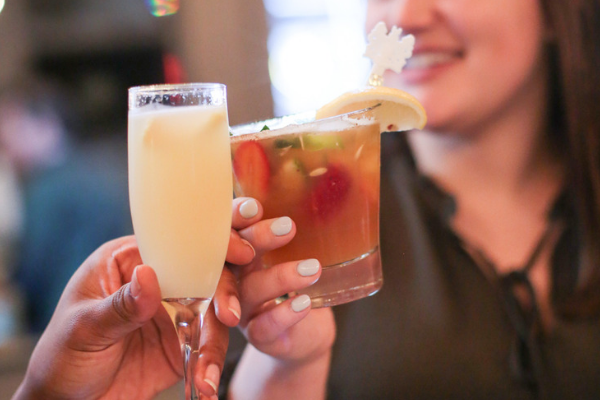 After choosing your favorite cocktail, try out our Bar Bites menu. Our Blue Crab & Crawfish Beignets and Seafood Okra Gumbo are local favorites. Be sure to arrive early to grab a seat at our famous rotating bar. It’s the only one of its kind in the entire Crescent City. For just a few dollars, you and your loved one can take a roundtrip streetcar ride down one of the most beautiful streets in New Orleans. Saint Charles Avenue features some of the city’s most beloved and iconic architecture. It’s also lined with majestic oak trees that create a lush canopy above the Avenue. At one end of the ride is Audubon Park, featuring a 2-mile tree-lined walking path that’s ideal for a handheld stroll, plenty of tranquil ponds, and open green spaces for a sun-soaked champagne picnic. A walk through historic Jackson Square under starlight can be incredibly romantic. 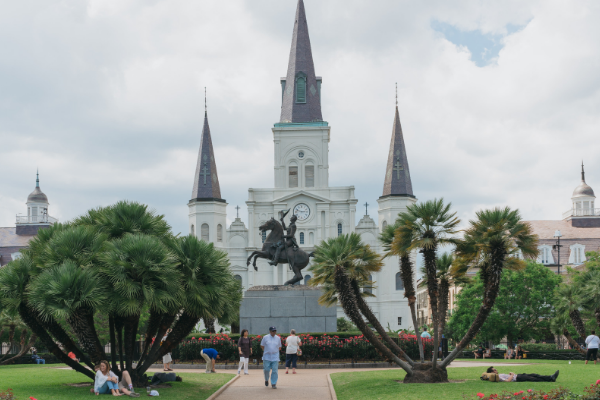 There’s so much going on in the Square — live music, beautiful local art displays, palm readings, access to great local boutiques, and the most famous beignet shop in the world just across the street. Another historic landmark, the St. Louis Cathedral, is also located in Jackson Square. Its towering steeples are the oldest in the United States, and its iconic architecture is marveled at by countless guests every year. If you would rather stay indoors and relax, there are a few places you and your special someone can cozy up and watch a film. The Theatres at Canal Place are within walking distance of our hotel. They show a mix of mainstream movies and indie films in a super comfortable and intimate seating arrangement. Order tapas, wine and cocktails right from your seat while you watch. You can also venture out to The Broad Theater, a newly renovated four-screen cinema in Mid-City or visit the historic Prytania Theatre. The Prytania was built in 1914 and is referenced in the book A Confederacy of Dunces. Located on historic Frenchmen Street just steps from the French Quarter, Palace Market is a great destination for handmade New Orleans art. The Palace Market is decorated with beautiful white lights and showcases arts & crafts from dozens of great local artists. The Palace Market is a wonderful place to shop or simply walk through with your special someone. It’s also located just steps away from Frenchmen Street’s great music clubs, offering a diverse array of local live music. Hotel Monteleone is the perfect place to celebrate Valentine’s Day in New Orleans. You’ll love discovering all there is to do in New Orleans! From window shopping on Royal Street to a carriage ride with your loved one, one of our luxury New Orleans hotel suites is the perfect place to celebrate Valentine’s Day. Book today!